Today's post is really something I wanted to do for myself. 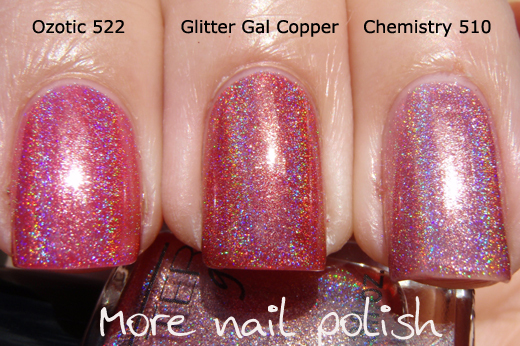 After wearing my new Glitter Gal polishes a few times last week, there were two things I wanted to try, this first was a comparison between Glitter Gal Copper and Ozotic 522. When I was putting on this comparison I though I would include Chemistry 510 as well, because they are all similar. In the sun, all three have a fantastic super strong holo. As you can see, they are certainly not dupes. 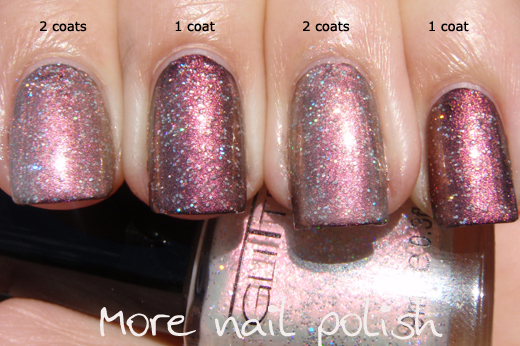 Glitter Gal Copper is the darkest and leans browner than the other too. 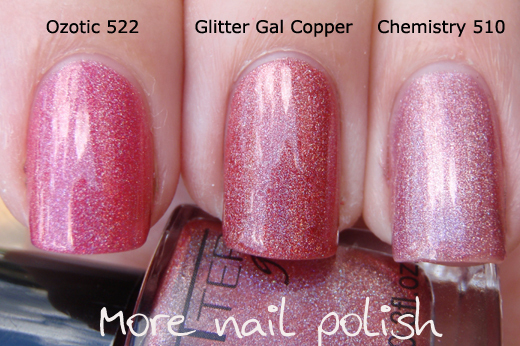 Ozotic 522 is one of my absolute favourites, but Glitter Gal Copper is now right up there with it, and depending on my mood, might be preferred. here they are in the shade where you can see the colour differences a little better. The other thing I wanted to try was Glitter Gal White Sparkle over black. Hello, this is amazing. Over black you can really see the pink tone to this polish. I was originally going to do two coats over black, but after applying the second coat to the index finger, I though it was a little too opaque, so I left two fingers as just one coat over black. These first two photos are in the shade. Wanna see the duo chrome shift? Here it is. 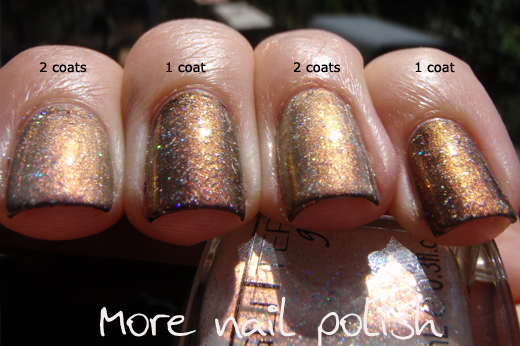 So it goes from pink to gold and really makes this polish so much more interesting. The only thing I don't love about this polish is that the holographic glitter particles can appear a little lumpy withing the delicate base colour. PS You must come back tomorrow as I have a very special announcement about a competition/giveaway. That Glitter Gal White Sparkle certainly was a surprise package - it's really versatile as well as so pretty. 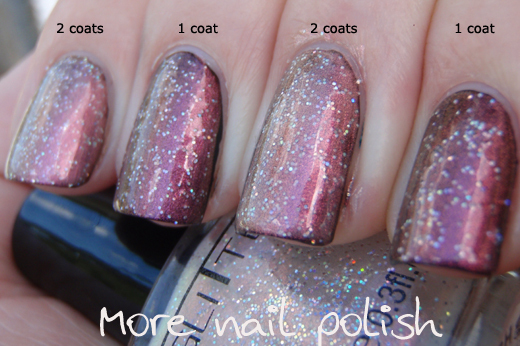 I'm amazed by these polishes... the comparison is really interesting. I love holo covers. 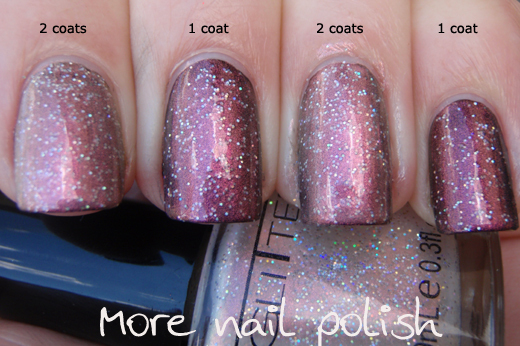 Fantastic comparison, I love holo covers. Oh gosh, White Sparkle is so perfect!